Designer-made solid sterling silver chains that will set off your Hawaiian jewelry beautifully. The ever increasing range includes many designs, from the usual to the unusual. 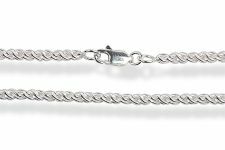 This solid sterling silver range includes the following stylish designs: Bead/Ball Chain, Box chain, Cable chain, Curb chain, Cardano Chain, Figaro Chain, Herringbone Chain, Omega Chain, Rope Chain and Snake Chain. Some of the range includes the beautiful feature of diamond cuts, which adds to the sparkle. 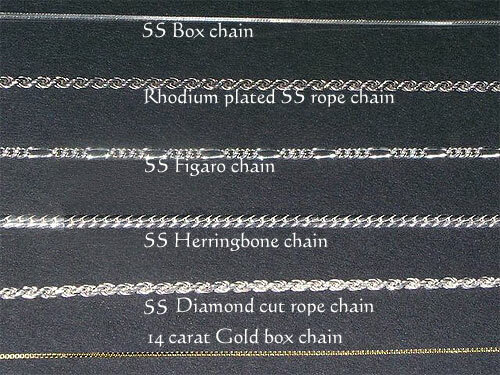 The following designs are also available with rhodium plating, which adds additional anti tarnish properties and with a look of expensive platinum at a very affordable price: Box chain and Rope chain. The Hawaiian jewelry range has many pendants with rhodium plating too, so these chains will match perfectly! Should you be looking for a particular design, or size, and it is not listed - please e-mail as it may be available or can be ordered for you. 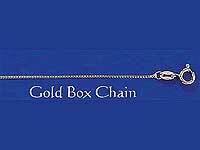 Curb new Curb new 2 Snake flat loop Box Chain - Solid 14 carat Rose Gold - 40cm - 16"
Box Chain - Solid 14 carat Rose Gold - 45cm - 18" Box Chain - Solid 14 carat White Gold - 40cm - 16" Box Chain - Solid 14 carat White Gold - 45cm - 16"